And the Pursuit of Happiness! Can this really be called a blog? If so, then what I am doing is something much less, perhaps just a bl. 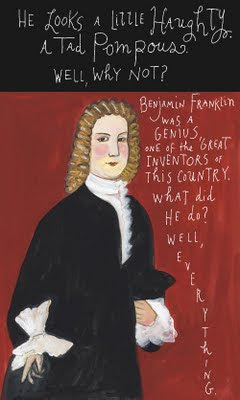 I just discovered And the Pursuit of Happiness, Maira Kalman's monthly illustrated feature about American democracy which the New York Times calls a blog. It's wonderful. The current one (July) is about Benjamin Franklin. Earlier posts I looked at just now featured Memorial Day and Lincoln. I'll have to go read the rest of them when I have time, which I don't now. I have to write a short PowerPoint called "The Once and Future Moon" for my presentation at Starfest 2009 tomorrow night. It has to be short because I will have just 30 minutes and I also have to launch a Saturn V, land Apollo 11 on the moon, and take NASA's future Orion and Altair spacecraft for a quick spin around the moon (all courtesy of the Orbiter space flight simulator). Yes, I did wait until the last minute. I better get busy. Last night I was wondering whether my iPod Touch could help me with song lyrics - finding them (other people's) and writing my own, especially when it comes to rhymes. Turns out it can help quite a bit. I found a bunch of rhyming dictionaries at the iTunes App Store and bought two of them for 99 cents each. One is simply called Rhyme and it seems to not require a web connection. The other is called Rhyme Time and only works with a web connection (Wifi for the iPod Touch), because it's essentially a front end to the RhymeZone web site. Because of this, it provides a lot more rhymes. I also bought a cool app called Lyrics+ which will find and display the lyrics for songs you have on your iPod, and also allows you to search by artist and title. It doesn't have lyrics for everything, but it's pretty extensive (web connection required). 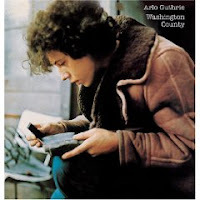 I happened to search for Arlo Guthrie and rediscovered an old favorite album that I used to have on vinyl, Washington County. So I bought that on iTunes. Serendipity strikes again! Especially for Apple. It's great when friends visit from out of town. For one thing, you get to see things in your own area that you'd probably never see otherwise. When my friend Rob Simbeck visited from Nashville last week, we hung out and did music and stuff, but we also took a day trip into Cambridge. After lunch at the geek-chic Miracle of Science Bar & Grill, we spent a few hours at the MIT Museum, which amazingly enough, I had never visited. 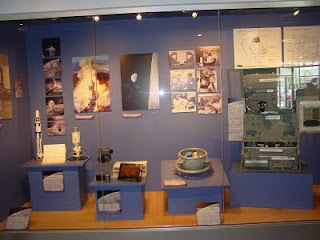 The MIT Museum has especially great exhibits on robotics and holography, but I also liked the small exhibit on Apollo. Much of the work on guidance and navigation was done at MIT's Draper Laboratory, including the development of the AGC (Apollo Guidance Computer - try it for yourself, or read the history here). Some of the development hardware was on display, along with a reproduction of a large blackboard showing the Command Module GN&C Block Diagram (interactive version here). Very cool stuff. It's also cool that forty years later, Draper Labs continues to be involved with systems for landing on the moon, as discussed in this recent article in the MIT Technology Review. Their system for NASA's Altair lander will be a lot smarter and friendlier than the AGC. 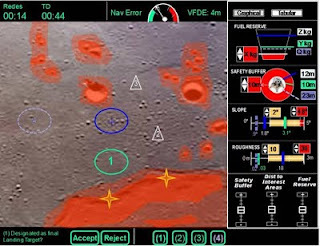 It will use LIDAR (laser radar) to accurately characterize the lunar surface so the software can recommend the best landing options, as shown in the simulator image above. 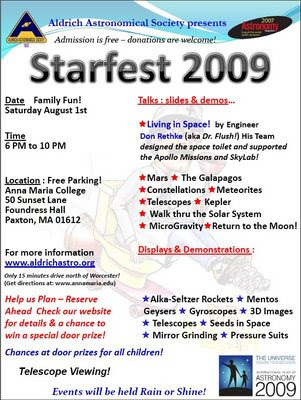 Starfest 2009 (PDF) is the Aldrich Astronomical Society's big annual public astronomy event (parking and admission are free, though donations are welcome). It will be held, rain or shine, next Saturday, August 1, from 6 to 10 pm, at Anna Maria College in Paxton, MA, just a short distance from Worcester. In addition to telescopes, demos, and presentations by members, we are also happy to feature a special presentation by Donald Rethke, also known as "Dr. Flush." 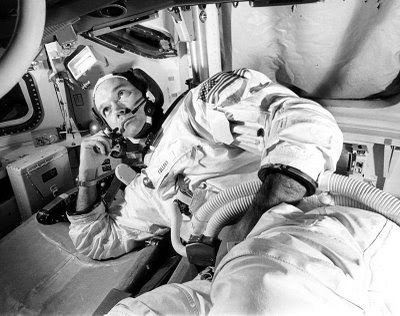 Don is a retired engineer from Connecticut who worked on life support systems for the Apollo program, and also on the development of space toilet systems (hence the nickname). I've seen several of Don's presentations at the New England Air Museum, and he is an engaging, educational, and funny speaker. We are happy to welcome Dr. Flush and his collection of space flight paraphenalia for his first Starfest appearance. He will do two presentation sessions, 6:30 and 7:45 pm in the Zecco Performing Arts Center at AMC. My presentation will be called "The Once and Future Moon" - a brief look back at Apollo at 40, and a briefer look forward at NASA's plans to return to the moon. 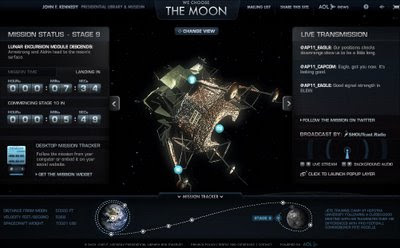 Naturally it will include a simulated Saturn V launch and Apollo 11 moon landing using Orbiter. If you happen to be in certain fortunate parts of Asia or the Pacific on July 22, 2009 starting at 00:14:54 UTC, you may be able to witness the longest total solar eclipse of the century. For information on how you can view the eclipse on the web, check the links on this site. Eclipse predictions including the animated GIF above are by Fred Espenak of NASA's GSFC. Based on past experience, it may not actually be animated on my blog, for reasons I don't understand (if not, see it animated here). I think I may have fixed it with some brute force HTML editing to override Blogger's handling of images. If this eclipse signals the end of the world as we know it as some superstitious people no doubt believe, then, hey, it's been nice knowing some of you! I just learned about "We Choose the Moon," a special "live +40 years" web site from AOL and the JFK Museum. It's feeding "real time" audio from Apollo 11, but displaced by 40 years! I happened to "tune in" at about 17 minutes before the Eagle landed (that was at 4:17 pm EDT). So now it's just a few minutes before landing, and it's audio-only, static and all, program alarms, NASA commentary, just like it was for those of us watching TV or listening to radios on this day back in July 1969. Very cool idea! I'll have to tune in for Neil's first steps tonight. It was forty years ago today: of course I'm referring to Neil Armstrong and Buzz Aldrin landing on the moon on July 20, 1969, not when Sergeant Pepper taught the band to play (that was twenty years ago today). I'm having a busy summer, and what celebrating I was able to do for this historic anniversary took place last Thursday (July 16) which was the anniversary of the Apollo 11 launch. I spent the second of three Thursdays in July at the Boston Children's Museum, doing "live" demos to supplement their Living in Space exhibit. I say "live" because I was actually using the Orbiter space flight simulator and the great AMSO Apollo add-on package to perform simulated Saturn V launches and Eagle (LM) landings at Tranquility Base, while sharing my reminiscences of July 1969 with visiting kids and their parents. I had a number of other pre-planned simulation events (e.g., docking the shuttle with the ISS just like the real STS-127 mission now in progress), and with a billed schedule of such 15-20 minute "happenings," the second day was much busier and more fun than the first (for the kids and for me). Only a few of the kids understood the significance of that historic week forty years ago. More of the parents got it, though most of them were too young to remember it themselves. And what was the significance of that week? 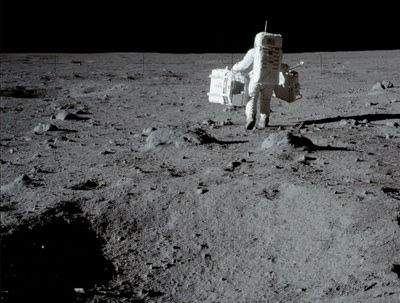 If you read Tom Wolfe's NY Times essay on the Apollo 11 landing, you'll learn that it was "one giant leap to nowhere," and that this was because Apollo was actually a high-tech version of sword play between the Soviets and the Americans, and because while NASA had many scientists, engineers, and adminstrators, they had only one flawed (former Nazi, oops) "philosopher," Wernher von Braun - not enough fire power and "Words" to justify pushing on to Mars once the Soviets were beaten in the moon race. Bummer. I know that NASA only got the budget that it got in the sixties because the space race was a proxy for the Cold War, and I know we've been "stuck in low Earth orbit" since 1972, but I'm still a bit of a romantic when it comes to interpreting Apollo 11, whatever its political genesis, and however delayed its ultimate effects may be. For the first time ever, humans left the Earth and landed on another body in the solar system. That was an insanely bold and cool thing to do, especially with the technology of the 1960's. It was way ahead of its time. But it showed that we could actually leave this planet when we want or need to, and go to other places. Of course all the other places we will eventually visit and inhabit are much, much farther away than the moon, and the energy and technology required will be much greater. But when the time comes, we can do it, we can go to those places. Of course we should do our best to repair and maintain this planet - Earth is the Cradle of Mankind, and while one normally doesn't stay in the cradle forever, it has been a pretty spacious and human-friendly cradle, so most of us will stay as long as it remains habitable. But there's no guarantee that it will remain habitable forever - there are a lot of ways that we and/or "Nature" could mess that up, and I for one would like to have a long-term backup plan. Robots are great for science and exploration, as are humans, but I'm talking about places where humans can eventually live. The Apollo program was an impressive proof of concept and down payment on those future developments, not to mention a tremendous inspiration to me and to many thousands of other engineers and scientists of my generation. Whatever Neil's exact words or intended words may have been when he hopped off that ladder, it was indeed one giant leap for mankind, and if there are still people around to remember things a couple of hundred years from now, I would bet that Apollo 11 will be one of the few events of the 20th century that will be considered worth remembering. There are so many things happening to commemorate the fortieth anniversary of the first moon landing, and I just don't have time to absorb most of it. I did read a couple of interesting pieces in the New York Times (iPod edition) this morning, including a nice reminiscence by John Noble Wilford who covered the Apollo program for the Times back in the day (if you search nytimes.com for "wilford moon" you can pull up his original articles, though you have to pay to read such archive articles). Good thing I've been absorbing the Apollo program for a good 45 years myself or I'd really be feeling some pressure this week! Thursday is the anniversary of the Saturn V launch for Apollo 11 (July 16, 1969), and I'll be at the Boston Children's Museum again, helping out with their "living in space" exhibit. I plan to use Orbiter to launch a few simulated Saturn V's for the occasion. And that evening I plan to watch a PBS special, "Apollo 11: First Steps on the Moon," which will air at 9 pm on my local PBS station (WGBH Boston). The video here is a brief trailer for the show. I posted a new tune on Garageband.com, "Achin' All the Time." 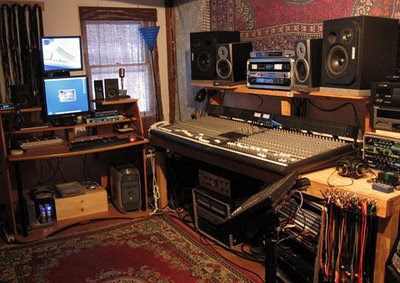 I actually wrote it and started the recording on it in 2003, but did some additional work on it recently with Roger at the Tremolo Lounge (pictured) to get it ready for the new album I'm working on. I need to remember to take a camera to my next session so I can get some studio shots with Roger's beagle sidekick Mr. Henry. This is a song that started out in Band-in-the-Box, using a reggae style backing track. I'm not much of a reggae artist so when we recorded it, we went for more of a straight rock ballad. Steve Mossberg played some keyboard tracks, and I especially like the organ solo he did. Lyrics are on the Garageband page. I also added the song to MySpace Music. We're coming up on the 40th anniversary days for Apollo 11 - the mission launched on July 16, 1969, and the first moon landing was on July 20. I just listened to Nancy Atkinson's 365 Days of Astronomy podcast from July 11, "Apollo 11 Through the Eyes of a Young Girl." Nancy even put some of her memories into musical form with a folk-style song called "Who Flies the Ship When Mike Collins Goes to Sleep?" Neil and Buzz get all the glory, but it's good to remember Mike, too (pictured above, training for Apollo 11 - it's hard to find photos of Mike in space!). My own memories of this time in 1969 are not musical (yet! ), but they are pretty vivid. 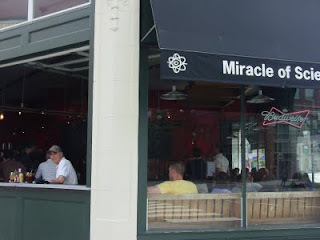 As I wrote back in 2007, that was the summer between my junior and senior years in high school, and I was lucky enough to spend six weeks of it at Ohio University in an NSF-sponsored Student Science Training Program. There was a TV in the lounge of my dorm (I think it was Washington Hall), and that's where I watched with a bunch of fellow high school science students from all around the U.S. as Neil Armstrong took his first steps on the moon (it wasn't all science - we had some great field trips and I even had time to develop a serious crush on a girl from Virginia). I had just turned 16 in June and was still planning to be an aeronautical engineer - it really seemed like anything was possible that summer, and that the way to do "anything" was through science and engineering. I finally ended up an optical engineer (with a few detours along the way for computer science, physics, and music), but I certainly attribute my strong interest in science, math, computers, flying, and space to the U.S. space program, especially the Gemini and Apollo programs that I followed intently through my elementary, junior high, and high school years, 1962 to 1970. He provides ad-free Word files in addition to web-formatted (HTML) pages! This is saving me hours of time in addition to getting me to start playing some songs recorded after 1980 - thanks Rob! Rob also has a blog which is quite cool, and to make sure you have no trouble determining what it's about, it's called A Guitar Teacher's Lesson Notebook. None of this namby-pamby "music of the spheres" business (is it music? is it astronomy? it's both! it's other stuff too!). He's got great playing and equipment tips, funny stories, inspirational ramblings, videos, photos, etc. (and almost as many guitar effects boxes as my producer Roger - almost). 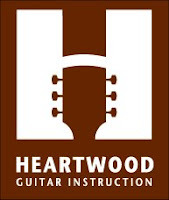 If you play guitar (or are even thinking about playing guitar), check out Rob's site and blog. His stuff almost makes me wish I lived in Seattle so I could sign up for lessons with him - except he's got a five year waiting list, so I guess I'll stay in New England for now. July is here and I'm realizing that the educational outreach events I've signed up for are coming up fast. I've got three events at the Boston Children's Museum in July (9, 16, and 30). Several other Solar System Ambassadors are also doing "walk up" events to supplement a temporary exhibit called "Living in Space" (May 24-September 8 in the Global Gallery). This is a traveling exhibit inspired by the International Space Station and intended to show children what it would be like to live, work, and play in space. The hands-on exhibit was created by the Children's Museum of Memphis. I'm looking forward to seeing this myself! My supplemental "walk up" presentation will include demonstrating shuttle launches, moon landings, and solar system tours with Orbiter, and I will also have 3D glasses and posters of 3D Mars images from JPL. See the BCM calendar for the schedule for other Solar System Ambassadors' presentations. You probably already know this since it went up on June 29, but this week’s Carnival of Space is hosted by Jennifer Oullette at Discovery Space's Twisted Physics.